The majority of Tennesseans still don't get it. When 80% of the Tennessee population see their incomes go down and 20% see their incomes go up, it's not because of a lack of effort on the part of the 80%. It's the lack of a level playing field. This growing inequality will have consequences. Firstly, the economy depends on the buying power of the population. The 20% can only buy so many Mac Mansions, Mercedes, and yachts. Without the spending of the 80%, the economy will grow slowly or not at all. Secondly, we all depend on the 80% to provide us with the goods and services we need to live our everyday lives. Without enough income to afford a place to live and pay for everyday needs, they cannot provide these services. Thirdly, if the 80% can't see any way to get out of this group into the 20%, they have no hope and some will give up trying to become productive citizens and instead will become a burden to the rest of society. There is far too much talk about the 80% being moochers and socialists and too little realization that every single American is a recipient of government dollars in one way or another. In fact, it seems to me that the biggest recipients are the richest and most powerful in our country, including all of the businesses that depend on government contracts for their profits. The recent loss in the Presidential race by the Republicans has been blamed on the majority of the people getting aid from the Government and therefore were influenced to vote for the Democrats. However, it appears that these voters are only asking for a level playing field that will allow them the same opportunities the 20% enjoy. The following article was in the Tennessean newspaper this morning and details the growth of income inequality in Tennessee. This article isn't about class envy or class warfare. It's just stating the facts. It's becoming harder and harder for the 80% in Tennessee to get an even shot at success with the 20% who are in control creating policies that result in the money flowing in their direction. Incomes for the bottom 20 percent of Tennessee households fell by 12 percent over the course of nearly a decade, increasing the gap between the state’s haves and have-nots, according to a new report. The report by the Center on Budget and Policy Priorities and the Economic Policy Institute found income inequality grew in 45 states, including Tennessee, between the late 1990s and the mid-2000s. Those were the last two periods when the economy was at or near a peak, according to the authors, and therefore a fair framework for comparing income gaps. Nationally, when adjusted for inflation to 2009 dollars, incomes dropped by 6 percent for the average low-income family, the study found, and rose by 8.6 percent for the top 20 percent of households. Average household income for the richest 20 percent of the state’s households from 2008 to 2010 was 7.8 times as high as the average household income for the poorest 20 percent, giving Tennessee the 19th-widest gap in the nation, the study says. New Mexico had the widest, 9.9 to 1. Elizabeth McNichol, another co-author, said households on the bottom and middle steps of the American economic ladder have struggled in an economic climate marked by long periods of high unemployment, which kept wages down; globalization, which has forced U.S. workers to compete for jobs with workers in other countries; a shrinking pool of manufacturing jobs; and a federal minimum wage that hasn’t kept pace with the cost of living. McNichol said the income drop for Tennessee’s lowest earners was “very significant.” She said the lack of a state income tax probably played a role in the advances made by the most prosperous residents compared with the poorest ones. “Tennessee does have a very regressive tax structure that would tend to widen the gap,” she said. But the idea of implementing a state income tax has been a political dead letter since 2002, when protesters honked horns outside the Capitol as the General Assembly considered legislation inside. Most candidates for legislative posts and the governor’s office have refused to reconsider it. Contact Michael Cass at 615-259-8838 or mcass@tennessean.com. 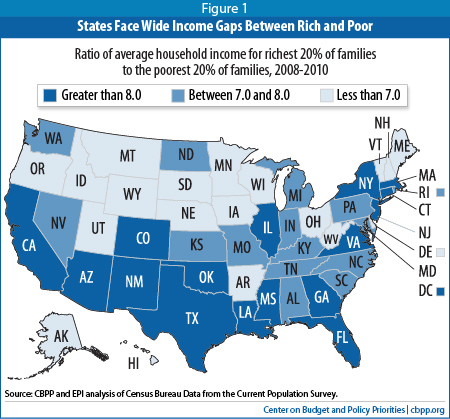 The gaps between the incomes of the richest households and poor and middle-income households are wide and growing in most states, according to a major new report from the Center on Budget and Policy Priorities and the Economic Policy Institute that examines inequality at the state level.